Drive up. Put the kettle on. Pitch your Vango vehicle awning. Sit back and enjoy your cuppa. If you own a campervan or motorhome, a Vango poled awning or inflatable awning is a must-have for all of your road trips, for wherever you go! 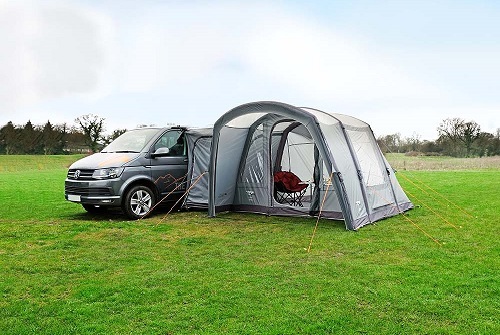 Launching Vango AirAway® in 2013, our collections have excelled in the campervan and motorhome world, inspiring our team to design even more awnings ideal for your vehicles. Not quite ready to convert from poles to AirBeam® yet? This year we have introduced a brand-new range of poled vehicle awnings, ideal for first-timers and those always on the move. Fabric innovation across our range has been a key development for our team. Our research and focus have resulted in the introduction and updating of three fabrics specifically for our awning range which will beat the elements come rain or shine. 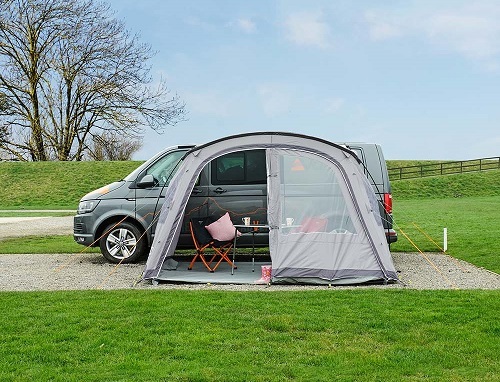 For 2019, the Vango Vehicle Awning collection continues to grow with a fantastic 8 new styles added to the range. 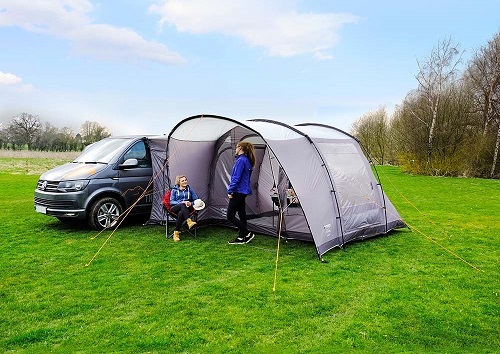 The Vango Experience collection introduces 3 brand-new poled awnings and 3 new AirBeam® awnings, which are ideal for those going on their first road trips thanks to their compact size and easy to assemble structure. Updated for 2018 are our most-loved Airhub Hexaway, Galli, Galli Compact, Cruz and Kela, all updated with some fantastic new features and a brand new colour palette. Finally, we introduce another 2 new drive away awnings to our collection featuring a breathable TC fabric, perfect for continental use! Whether you prefer heading off for a quick weekend trip with friends or treating your family to a relaxing week at the holiday park, we’re sure our collection of drive away air awnings and brand-new poled awnings will accommodate your lifestyle, wherever you go. A stylish, practical one-poled awning which is extremely simple to assemble and take down for when you want to head out for the day. The Bondi features our Sentinel Active fabric, offering a fantastic combination of strength and a light weight, ensuring the awning is compact, waterproof and very durable. 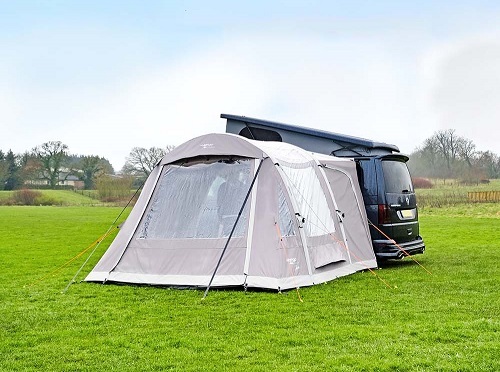 Brand-new to the 2019 poled awning collection, the Faros features quality fabrics and PowerFlex® fibreglass poles for a strong and reliable structure. The Faros can also be left freestanding while you head out for the day, then easily re-attached to your vehicle upon your return thanks to its lightweight structure. A fantastic, compact-sized poled awning allowing you to face the same way as your vehicle with its side tunnel attachment. 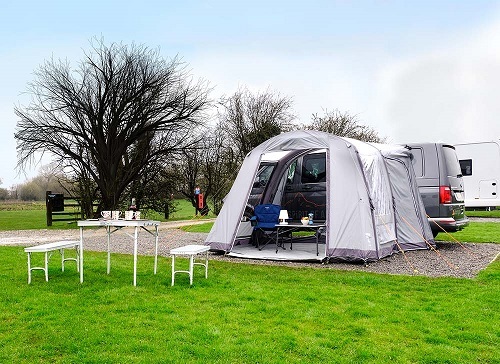 The Noosa features a pre-attached front extension to provide shelter from sun or rain and the toggled curtains ensure more privacy when needed. 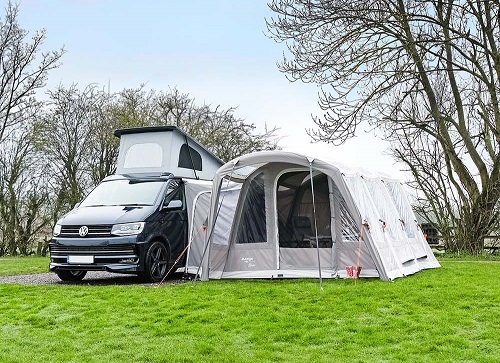 Joining the collection for 2019 is the Siesta, designed to be a lightweight and compact awning with a single beam for quick and easy inflation. The Siesta is extremely versatile, allowing you to open the front door fully, halfway or keep it closed for privacy. Not to mention its flat-entry groundsheet, ensuring easy access. 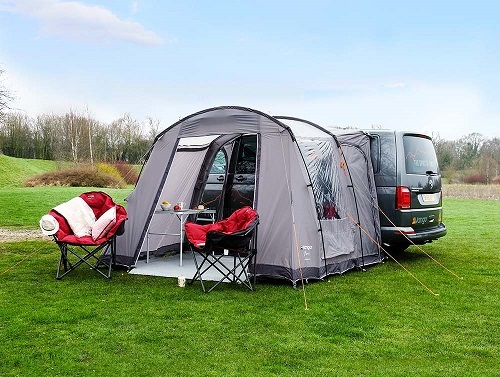 The Vango Palm Air awning is the perfect space for all of your gear, whether you are relaxing after a day outdoors or require storage space for bikes. The front door can be converted into a canopy with optional King Poles, allowing even more sheltered living space. New for 2019, the Cove Air offers an ideal space for couples or families off on an adventure. 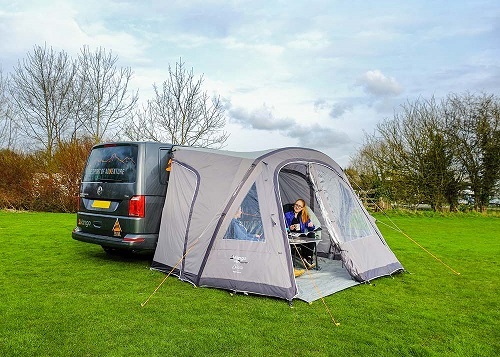 The front-facing awning is positioned to face the same way as your vehicle to ensure you are always facing the view, whilst having added privacy from your campsite neighbours. The Jura has been designed with our brand-new Sentinel Signature fabric which makes it great for continental use thanks to its breathability to regulate temperature. Diamond Pro windows and two mesh doors ensure you are always enjoying the view whilst being in a comfortable environment. Expanding the 2019 AirAway® collection is the Rhone, perfect for couples or families looking for extra space to increase their living and storage area. The luxurious Sentinel Signature fabric means the temperature will remain comfortable during fluctuating temperatures and a fully sewn-in groundsheet provides a bug and draught free environment. All Vango Vehicle awnings are wind tunnel tested to 100kmph and have fully waterproof taped seams, ensuring fantastic performance even in adverse conditions! Take a peek behind the scenes of our 2019 Awning Photoshoot!